What's our schedule look like? What do we have on hand? What recipes and meal ideas fit our schedule? What do we still need to round them out? From steps 1 -3, I pick recipes/dishes and write them in the "Dinner" space on my calendar. From step 4, I make my grocery lists(s). That's really all there is to it. Some weeks I feel more creative, and some weeks we have very basic, uninspired meals . . .but everyone gets a healthy meal and we don't waste too much food or money. It's not glamorous or perfect - but it works. 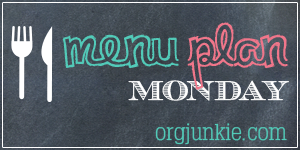 What's on your meal plan for this week? We do tacos almost every Tuesday as well! Menu looks delicious! You process is pretty much exactly how I do my menu planning...I find that looking ahead on the calendar and seeing what is going on is so important to successful meal planning! Looks like our kind of menu! I, too, work my meal plans like you do! Have a great week!